As with Vienna Dimension Strings I & II, all of the human interactions and slight imperfections of a live performance have been captured. The players were recorded in four homogeneous groups, but with dedicated microphones for each player, allowing for automatic or manual access to each individual voice and resulting in unlimited performance flexibility and authenticity. 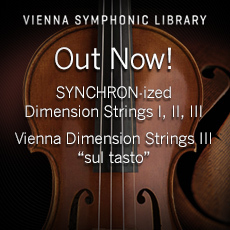 * Your purchase of Vienna Dimension Strings III entitles you to download the free Vienna Instruments software player. By using the optional player Vienna Instruments Pro with its Polyphonic Legato and Auto Humanization features you’ll make the most of Vienna Dimension Strings III.